The Governors Ball just a big boost from Axl Rose: Guns N' Roses have been added as headliners for the New York festival in June, joining Kanye West, Kings of Leon, Nas, the Avett Brothers, Grizzly Bear, Kendrick Lamar, the Lumineers, Animal Collective, Feist, Gary Clark Jr., the Dirty Projectors, Japandroids and more. 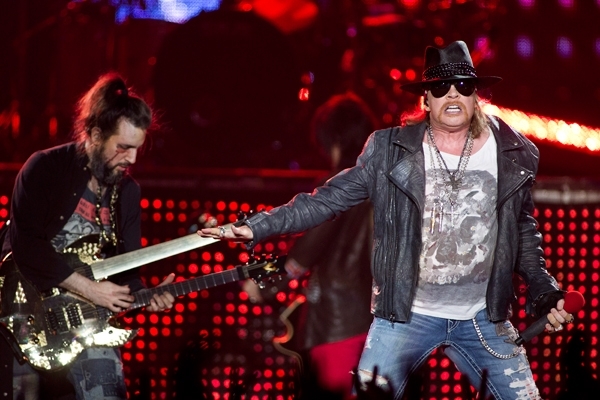 The festival will be Guns N' Roses' first major U.S. gig since the band's Las Vegas residency last fall. The rockers also performed at Neil Young's annual Bridge School Benefit last October. The band is set for a short tour of Australia with ZZ Top in March. The Governors Ball will take place in Randall's Island Park on June 7th, 8th and 9th. Tickets and the full lineup are available on the festival's website.